by creating a photo collection element to the experience. I would have to get a pair first to fully back this. Maybe something better than what a screen-shot can offer? I would assume there be a micro-site where shoe owners could share funny images that they experienced. Will we start seeing more and more augmented reality products this year? I hope these campaigns keep coming and that advertisers really invest some good resources into producing higher valued goods. 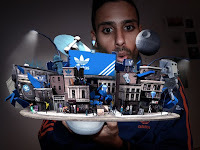 Get ready for an awsome video as the foot gear crawls over your screen, the Adidas augmented reality campaign is sure to be huge. I can't wait to watch the feedback and exchange of pictures and stories; will be keeping a close eye on it. Please guys, comments and feedback are welcome. If you think there is something you can add to this, please do. enjoy the release of actual visual imagery features on shoes!